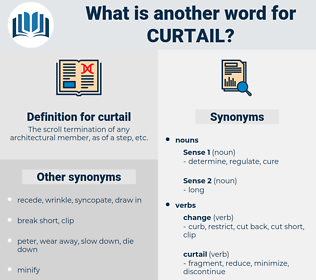 What is another word for curtail? The scroll termination of any architectural member, as of a step, etc. reduce, limit, confine, inhibit, circumscribe, obstruct, limitation. reduced, reducing, limiting, reduce, limit, constrain, restrain, shorten, mitigate, suppress, minimize, diminish, halt, stop, abbreviate, lessen, interrupt, contain, hinder, hamper, abridge, decrease, eliminate, counteract, dampen, stifle, discontinue, rein, thwart, stem, impair, shrink, downsize, confine, counter, disrupt, eradicate, narrow, weaken, frustrate, inhibit, deprive, repress, slash, terminate, preclude, detract, undercut, cease, lower, ameliorate, tackle, relieve, suspend, abate, slow, combat, Combating, de-escalate, reverse, Reversing, constrict, interdict, quell, lighten, circumscribe, obstruct, trim, attenuate. enlarge, lengthen, grow, raise, develop, expand, prolong, extend, increase, strengthen, amplify, stretch. boost, swell, balloon, maximize, heighten, inflate, blow up, distend, supplement. It would be in their power, too, to curtail those banks to the amount of their actual specie, by gathering up their paper, and running it constantly on them. The first result of the Wartburg scandal was that the Duke of Weimar had to curtail the liberties of his subjects. cordially, checkered lily, cartwheel, courtly, courtelle, crottal, cradle, credal, crudely, curtal, curdle, chordal, chortle, crottle, creedal, curtly, cordial, crude oil, cartel, Cordell Hull, cowardly, crotal. control, immobilize, restrict, abridge, immobilise, ration. 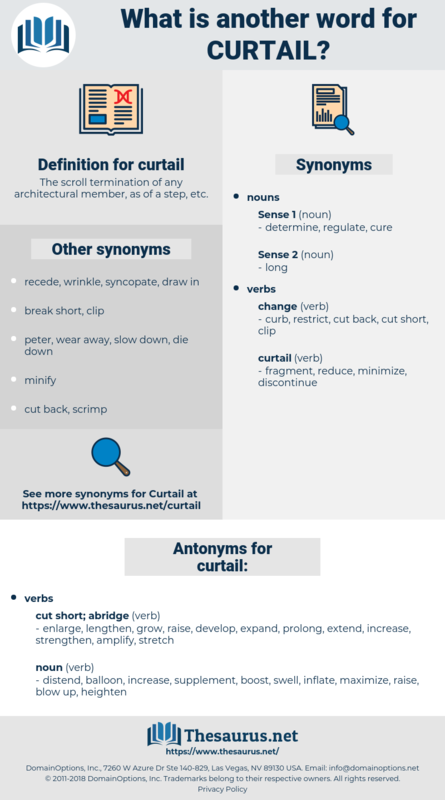 limit, confine to, shorten, circumscribe.